The New Year’s cassoulet turned out to be a bit of a bear as a leftover. 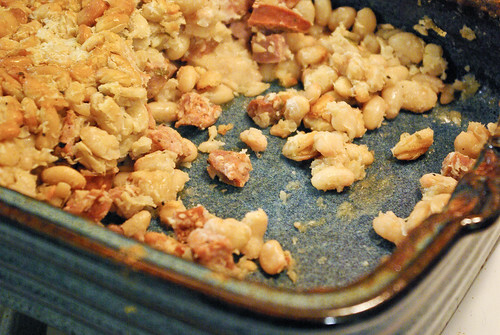 The lovely crust disappeared, and the beans soaked up any remaining broth and became rather dry. It still tasted great, but it definitely wasn’t as much fun to eat as when it was fresh. What to do? Make a soup! I figured the beans wanted more liquid, plus some vegetable to make them less dense and rich. 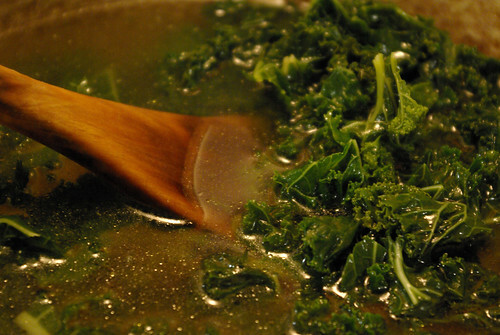 So I piled an entire bunch of curly kale into the soup pot with a container of chicken broth from the freezer and some olive oil, and let it braise for a while until the leaves were nice and tender. Then I just scraped all the remaining cassoulet into the pot, topped up with water, and emptied in a can of diced tomatoes. It turned out beautifully. 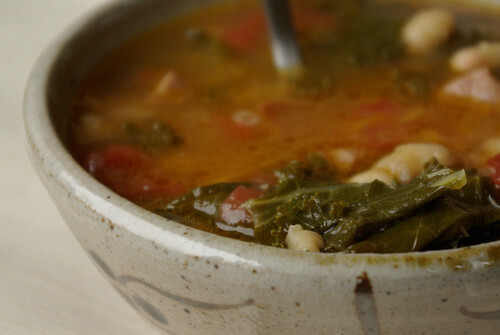 Some of the beans kept their shape, while others dissolved and thickened the broth. 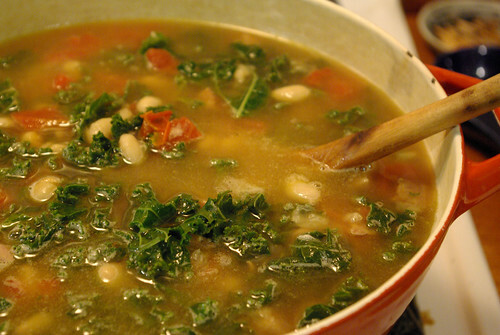 The flavor in the beans and sausage melded with the kale, while the tomatoes brightened the whole thing and added some much needed acidity. We ate the entire batch over the next three days. Very tidy. Nice. I finally made cassoulet to baptize the cute little cassoulet dish my daughter brought back from France several years ago. It was fun to find the duck, dismember it (I never knew that duck fat FELT so nice! Like a little macabre hand spa), make confit, find the not-what-I-wanted-but-what-I-found sausage and all the other bits. I ended up with enough cassoulet to feed southern France (including a lovely portion in the cute little dish). I like your soup idea, I just glugged in some leftover plonk and happily are it for a couple dinners and several lunches. Next time soup.